During the next five years the number of bottlers of soda water explodes due to the craze caused by Roussel's bottled soda and mineral waters; the likes of which the soda water industry had not yet experienced in the United States. What was his secret? Why did his soda and mineral waters ignite the business? The answer is the quality and taste of his product. Prior to this, soda and mineral waters were primarily medicinal in nature and likely had a unpleasant or bland taste. Almost from the beginning, fruit juices were added to soda and mineral waters to improve the taste, but none of these sparked the craze. Roussel was trained in Paris in the perfumery industry and ran a laboratory in the house of Laugier Pere & Fils. When he immigrated to Philadelphia, he brought with him refined recipes and the skills to produce them. The craze he created was so great that the demand for bottles triggered the reopening of the closed Dyottville factories in 1842. The number of different Roussel bottles for these brief five years is just as amazing. Why did Roussel's product create a craze? The answer is his product tasted great and the public could not get enough of it! Roussel is credited by early industry authors as being the first to flavor his waters with fruit juices or more accurately the first to bottle flavored soda water. Although neither is technically correct, he is the first to have made a success of it and thus deserves the credit as the "father of the American bottled soda water industry." In 1838 or 1839 the first syruped soda water was bottled in this country by Eugene Roussel, a Frenchman, who kept a perfumery shop in Philadelphia. He had a dispensing apparatus in his store, and the idea came to him that there was a legitimate extension of his business in the bottling and sale of soda water — or "mineral water," as it was then called. The first syrup bottled was lemon, and Roussel soon established a business and a reputation, and was followed closely by other Philadelphia competitors, so that within a few years there were no less than half a dozen manufacturers of bottled carbonates in the Quaker City alone. It took about six years for the new trade to reach New York, for in the Spring of 1843 three soda-water bottling establishments were opened in this city simultaneously by Philadelphians — John Tweddle, A. W. Rapp and Thomas Newton. They all started the same week. The first soda water sold in New York, of the bottled variety, was made by Roussel in Philadelphia and shipped to John Tweddle for sale. It was "pure food" soda even in those days, for the greatest care was exercised in its compounding and preparation; the sugar employed was the best loaf; the whites of eggs were used to clarify it; and the syrup was well boiled and strained before the flavoring was incorporated. The craze also spread to Baltimore, Boston, and New Orleans. Other cities were soon to follow. Each city will be address separately by state. By 1845, the soda water industry was firmly established and again led by Roussel a new style of bottle was introduced, which became the standard for the next 10 years. Without Roussel, soda bottles would likely be as rare as the bottles of the previous three decades and as collectors, and a drinking public we owe Roussel our gratitude! Charles B. Neale & Co. MINERAL WATERS.--We received a day or two since, from the manufacturer, Mons. Eugene Roussell, Chemist, 75 Chestnut street, a sample of his artificial Mineral Waters, put up on the French plan, in glass bottles, ready mixed, with all varieties of syrups, and calculated for immediate home use, for exportation, or to be used at sea. Upon being uncorked and turned into a glass, it effervesces freely, is very palatable, and is described as being superior to the artificial mineral waters drawn from the fountains, in common use in our cities, from being kept free from all liability to become impregnated, like them, with copper, from the vessels containing them. Both of the perfumery and mineral water businesses were advertised extensively. It is an interesting tidbit that according to the 1840 Philadelphia Census, this extensive promoter of perfumery lived next door to another self promoter of medicines, Dr. David Jayne. Roussel brought Xavier Bazin into his business about 1840 as a director of his perfumery laboratory. Bazin's skill no doubt contributed to Roussel's success. Roussel not only manufactured perfumery articles, but also imported and sold perfumery products from the leading houses of Europe as well as "fancy goods," which included combs, brushes, mirrors, and shaving items. Roussel's businesses were stunningly successful and 1842, a mere four years after his arrival in Philadelphia, was a pivotal year not just for Roussel, but Philadelphia bottles as well. During this year Roussel moved his shop to 114 Chestnut Street and his mineral water manufactory and perfumery to 44 Prune Street (now Locust). The Prune Street location was the site of Tivoli Theater and the first site of the Jefferson Medical School. More important to bottle collectors, Roussel created a demand for bottles that induced Henry Seybert, a successful chemist, to reopen the Dyottville Glass Works, which had not been operated successfully since Thomas W. Dyott's bankruptcy in 1839. M. Roussel was the first to introduce mineral water into the United States, in bottles, which he commenced in 1839. The sales of this water did not then average more than ten or fifteen dozen bottles per day, and at this time he puts up and sells from thirteen to fourteen hundred dozen, daily. Not less than one hundred establishments for the manufacture, have grown up since M. Roussel introduced its manufacture into the United States. The value of the corks consumed, alone, amounts to $10,000; sugar, $12,000; cost of bottles per annum, $6,000; number of bottles manufactured per annum, 4,500,000. The total value of mineral waters sold, amounts to $60,000. The amount of wages paid persons in the manufacture of the several articles, is about $20,000. M. Roussel has received several gold and silver medals from the different industrial institutions of our country, and we have no doubt but that the articles from his establishment are equal in every respect to those made in, Paris. Roussel filed his "Declaration of Intent" on October 7, 1844 at the Court of Common Pleas in Philadelphia. His "Oath of Allegiance" occurred on June 12, 1848. One has to wonder why he waited six years after arriving in the United States to files his intention to become a citizen. Perhaps he intended to return to France, but had made such a good life for himself, decided to stay. ROUSSEL'S MINERAL WATERS.--FACTORY, 44 PRUNE street.--The subscriber would respectively inform his numerous customers, that owing to frequent attempts recently made by unprincipled persons, to palm off an inferior article of MINERAL WATER, filled in his bottles, unlawfully obtained, and also in order to distinguish the water prepared by him from others, he has at considerable expense caused to be altered, the style and color of his bottles, in order that the public may be aware of what they are using. The imitations of his Bottled Mineral Water being so numerous, and the style of the bottle copied so closely, in order as far as possible to come into competition, has induced the subscriber to beg his numerous patrons to assure themselves of the fact, that they are drinking his Mineral Water, by observing his name on the bottle, which is readily perceived. He will continue to dispose of his Mineral Water as the original price, as his patrons must be fully aware that the cheaper and inferior article would be unprofitable to themselves from its limited sale, and from the fact that his mineral waters are sought after with avidity by all Hotels desirous of sustaining a reputation for the quality of their drinks. It is unnecessary for him to enter into long detail respecting the superiority of his MINERAL WATERS over all others, as it is too well known to need comment. Being the first to introduce the bottling of MINERAL WATER into this country, on the FRENCH PLAN, and after a practical experience of seven years, he has been enabled to excel in his line, owing to improvements peculiar to himself, and from extended facilities afforded by ample space, he feels confident he can furnish an article superior to any manufactured in AMERICA or in the WORLD. All orders executed with dispatch, and delivered to any part of the city or surrounding country, at ONE AND THE SAME PRICE. Orders delivered to any of the drivers, or at the store or factory promptly attended to. Based on the above advertisement and as evidenced by Roussel's bottles, he introduced the soda water shape and for the first time introduced the blue color to soda bottles. For this collectors are thankful. Roussel's many competitors quickly followed his lead and abandoned the old smaller shaped bottles with their shaper shoulders for the larger softer shaped soda shaped bottles. Initially these imitation bottles were of green coloration, but eventually they started to use the more expensive blue bottles. With one exception, the blue Roussel bottles were not only of a new color to soda bottles, but also used a new mold technology. The molds were no longer hinge molds, but much more refined molds where the base of the bottle was formed in a cup in the base of the mold. This transition year of 1845, became the endpoint for the scope of this article. In 1846, Roussel opened a branch office in New York at 159 Broadway as he continued to grow his business. He was, by his own claim in Doggart's New York City Directory for 1846, "awarded first premium for the last five years, at all the exhibitions of New York, Boston, and Philadelphia; and at the last exhibition of the American Institute of this city he was awarded the GOLDEN MEDAL, and honor never before conferred on any Perfumer." Advertisements during the 1840s for Roussel's products can be found across the United States and even in the frontier areas like Wisconsin. By 1847, Roussel was manufacturing mineral waters in silver to prevent the production of toxins that can be produced when copper comes in contact with carbonated water. He was awarded a silver medal in 1847 and combined those to facts on his bottles of the period. In 1849 Roussel sold the perfumery business to Xavier Bazin so that he could focus on the mineral water business. Bazin continued to capitalize on the Roussel name by using it in his advertising and on his marked containers. In 1853, Roussel purchased what was left of William Heiss' business and in 1854 formed a partnership with Wistar C. Parsons, which lasted until 1861. Roussel sold the business to George W. Otto in 1867 and the business continued for many years as George Otto & Company (1868-1872), Otto & Layer (1873-1883), Cunningham & Company (1884-1894), Cunningham Supply Company (1895-1913), Jacob Frank & Son (1914+). After his retirement, Roussel served as President of the French Benevolent Society and on the board of at least one other organization. He died on October 17, 1878 according to the Public Ledger newspaper. Roussel's bottles are numerous during the period 1840 to 1844. In fact they number at least seven distinct molds and a wide variety of colors. The earliest three molds were manufactured at South Jersey glass works based on the glasses coloration. Starting in 1842, bottles were manufactured at the reopened Dyottville Glass Works. These include the pint sized bottle. R either stood for Roussel or was meant to fool consumers into believing that Roussel's soda or mineral waters were contained within the bottle. It seems unlikely that Roussel, a master advertiser, would have had a bottle manufactured for his that was not clearly embossed with his name on it. It seems much more likely that this bottle was meant by an unscrupulous mineral water manufacturer who wanted his consumers to believe that they were drinking Roussel's waters. Roussel complained in his May 30, 1845 advertisement in the American Advocate of "unprincipled persons" attempting "to palm off an inferior article of MINERAL WATER, filled in his bottles." This manufacturer did not steal Roussel's bottles, but had bottles made that closely resembled Roussel's with the large "R" on the shoulder. These bottles were likely manufactured by the Dyottville Glass Works or one of the other Philadelphia area glass manufacturers. Several of these bottles have been found in the Philadelphia area and these bottles date to the period 1843-1844. William Heiss Jr. was a coppersmith on North Second Street in Philadelphia who later branched out into the bottled mineral water business. He was the son of William Heiss Sr., who was born October 13, 1786 and married Rachael Goddard on March 3, 1812. During 1808 William Sr. and a partner named Justice purchased the coppersmith shop of Jesse Oat at 184 North Second Street. Heiss' partner may have been George Justice, who had recently retired as City Commissioner and lived around the corner from the shop at 95 New Street. By 1813, Justice had withdrawn from the firm and William Sr. was operating the business on his own. During 1813, Heiss moved his shop to 213 North Second Street. This was a longstanding metal working location with George Goddard (1793-1899 blacksmith), Samuel Alexander (1799-1800 silversmith), Phillip Apple (coppersmith, 1802), and Benjamin Scott (copper plate printer 1808-1811) operating at this location. William Heiss Jr. was born about 1812. He appears to have taken over his father's business some time during 1837 or 1838. In a June 4, 1849 Charleston Mercury advertisement, William Jr. claimed to have over 12 years experience in manufacturing of mineral water apparatus. During 1838 or 1839, William Sr. retired from the business and was listed as a gentleman. He died on October 10, 1846. No. 213 North 2d-st., Philadelphia. Also, the large, superior Generator, made by myself and used in my own laboratory, with three cylinders, five Corking and Tying Benches, together with some other Machinery for the Soda business. The above generator is superior to any in the United States. I will also sell fifty Mineral Water Fountains, with Coolers, Connecting Pipes, Marble and Silver Pedestals, &c., and take part pay in good merchandise or real estate, unencumbered. The undersigned having purchased of Mr. Wm. Heiss his entire stock of MINERAL WATER BOTTLES, all persons who are in possession of Bottles marked with the names of HEISS or ROUSSEL, will please give information at the Office, 44 PRUNE Street, when they will be sent for. N. B---These Bottles, as well as my own, have been registered according to an Act of the Legislature of Pennsylvania, which "forbids all persons from buying, selling, using, filling or concealing any such Bottles so marked, under a penalty of 50 cents for each Bottle, for the first offense, and $5 for each subsequent offence, recoverable for the use of the Commonwealth." William Jr. appears to have withdrawn from the coppersmith business over the next couple of years and it was taken over by his brother Goddard Heiss, who still used the carvings of the golden eagle over a fountain at the old stand on North Second Street. At 46 years old, William Jr. died on May 15, 1858 of debility. Goddard continued to operate the business until 1866, when the premises were sold to Walter S. Stevenson & Company, who sold stoves. The Heiss bottles date from about 1842. None of his bottles appear to be of Dyottville manufacture. Dyottville was the manufacturer of his rival Eugene Roussel and Heiss utilized Union Glass Works for his later manufactured bottles. The earliest bottles have the appearance of South Jersey manufacture with their light green colors. The latest bottle also occurs in an aqua coloration. Heiss has a number of later bottles that include two eagle sodas and two sided bottles. One of the eagle bottles and the eight sided example come in a puce coloration. Peter Hall was an Englishman who settled in Philadelphia and eventually entered the bottling and malting business. From the 1860 Philadelphia Census, it is estimated that Peter Hall was born about 1797 in England. He filed his Declaration of Intent on February 8, 1833 and his Oath of Allegiance occurred on October 7, 1842. In 1843, we find his first directory listing as a bottler at 5 St. James and he remained there the following year. However, Graci in his book, Soda and Beer Closures 1850-1910, states that Robert Robinson, the famous New York City bottler and also from England, was given employment by Peter Hall in 1841 at his mineral water bottling business. He also states that Hall was the first competitor to Roussel in Philadelphia. So we can surmise that Hall was definitely in business in 1842 and possible as early as 1840. Hall disappears from the directories in 1845 and remains absent until 1848 when he surfaces as a bottler at 50 North Sixth Street. It is interesting that the Hall bottles are also reflective of this gap in years as there are no bottles that date to the period 1845-1848. Where he was during these three years is not known, but 50 North Sixth Street was a popular location to get malt beverages. As early as 1794, this location was a brewery (Henry Weissenback listed in 1794) and for many years it was the Larer Brewery (1803-1839) run by Melchoir Larer and his son John. Alexander Noble (1844-1845) and Joseph Sherhammer (1847) were bottlers at 48 N Sixth until 1847, the year prior to Hall reemerging as a bottler at 50 North Sixth Street. Bottling establishments were usually located in the basements of buildings that housed other businesses; thus the phrase bottling cellar. 50 North Sixth was also the location of Freedman's Auction house and later Young's printing establishment, which operated upstairs while Hall was busily conducting his business in the basement. In 1851, Hall was listing as operating a Malt House at Hutchinson & Thompson Streets in addition to the bottling establishment. Hall was steadily increasing his empire during the 1850s, but he is never recorded as having children or being married. With the street renumbering in 1857, 50 became 52 North Sixth. Hall's last directory listing was in 1861 and appears that he died during that year. According to IRS Tax Records, Lewis & Scott took over Hall's bottling business by September of 1862. In these records they were listed as retail liquor dealers and mineral water manufacturers at 52 & 54 North Second. The fate of the malting business is not known. Lewis & Scott (George W. Lewis & Thomas Scott) operated at this location until 1869 when Thomas Scott removed from the firm and started a mineral water business on South Street. On Scott's departure, Eber Thompson joined Lewis as Lewis & Thompson, who operated the works from 1869 to 1876. During 1876 Eber Thompson gained full control of the business and continued at 52 North Sixth until 1878, when he moved the business to 1525 Parrish Street. He remained at that location until closing shop in 1881. Thompson was still involved in the bottling business into the 1890s, but as a laborer and not a business owner. The earliest Hall bottle is only known in one mold, but comes in two distinctive colors. The earliest is a light green color and is likely of South Jersey manufacture about 1842-43. The second color is a dark green and was likely manufactured by the Dyottville Glass Works about 1843-1844. There is also a bottle that dates to about 1845 and many bottles that date to the later 1840s, the 1850s and early 1860s. John Diehl was a tavern owner turned mineral water manufacturer in South Philadelphia. We have found very little information aside from the Philadelphia City Directory listings. There were a number of different John Diehls in Philadelphia listed in the Census records, but none can definitely be attributed to the tavern owner. There is a listing in the 1870 Census that seems to fit, being an Irishman born about 1796, but no corroborating period records could be found. The first directory listing found for John Diehl was in the 1835 when he is listed as running a tavern on South Front Street at Catherine Street. He would remain at this location for the rest of his listings. Although his bottles date into the early 1840s, his first listing as a mineral water manufacturer was in 1847. The last listing for mineral water is in 1850 and his last listing at Front & Catharine as a tavern owner is in 1851. There are other John Diehls listed as bottlers during the 1850s, but they do not appear to be the same individual. More research is needed to shed light on this early producer of Philadelphia bottles. There are two molds of early Diehl mineral water bottles. The earliest are not embossed with the city name and this mold had at least two runs of bottles; one run of true green and a second of a blue green color. The early bottles date 1843-1844. A large cache of these bottles were dug in the Lehigh Valley in the mid-1970s. The later bottles are significantly rarer and bear the "PHILADA" embossing. These bottles bear an early form of an improved pontil that is smaller, deep and has an odd cross hatch pattern. These bottles date about 1844. There are later blue and green Diehl bottles, which includes one of the few sided Philadelphia soda bottles. Both bottles do not appear to be the product of the Dyottville Glass Works and may have been manufactured at another Philadelphia or South Jersey works. Doctor F. W. Hartley has not left much of a trail. He was listed for only one year as a druggist on the southwest corner of Third and Gaskill Streets in 1843. Patrick Logan was located at this location as a grocer the following year and Hartley disappears from the Philadelphia Directories. Logan remained at this location well into the 1850s. This is not the P. Logan of the stoneware bottle fame. The Patrick Logan that used the marked stoneware bottles operated the Temperance Brewery on Filbert Street in 1845. The Hartley bottle appears to have been produced about 1842. Hartley was listed in the 1843 Directory, which was produced in December of 1842 and it seems that this bottle was used during the 1842 summer season. This bottle was likely made in one of the South Jersey glass houses due to its color and the fact that the Dyottville Glass Works was closed down during this time. Bentley & Sons, like William Heiss, were Philadelphia coppersmiths. David Bentley was born about 1783. As early as 1813, he was listed as working as a coppersmith. In 1820, he partnered with John Bentley under the name of David & John Bentley as coppersmiths and sheet metal workers at 112 North Fourth Street. By 1825, they had relocated to 162 North Third Street and this was to be the permanent location for the next 55 years. Some time during 1833 and 1834 John Bentley left the firm and David continued to operate the business alone. In 1842, David took his sons into the business. The sons were John, J. B., and David C. The name of the firm was changed to David Bentley & Sons. Some time in 1843 or 1844, Bentley & Sons started to manufactured mineral waters. This was a natural extension of the business, as they likely were manufacturing the copper apparatus to manufacture these waters. Over the years the sons dropped out of the business and David was listed as the sole member of the firm. In 1857, with the renumbering of the streets in Philadelphia, 164 North Third Street, became 254 North Third Street. In 1860, his wife Anne C. was listed as partner and on David's death in about 1877 she became the sole partner in the firm. The firm appears to have been dissolved during 1879, as it is not listed in the 1880 Directory. The sole Bentley bottle dates to about 1844. The bottle has the appearance and color of being manufactured at the Dyottville Glass works. One damaged bottle was found in Columbia, Pennsylvania and a damaged an whole example were found in the area of Northern Liberties close to North Third Street. Robert Flanagan, 1859.—Kept the Pat Lyon Hotel, Sixth below Race street. He is said to have originated building associations in Philadelphia. He died November, 1861, leaving a wife and children. Bernard Rafferty (1866) was one of the executors of his will. EXPLOSION OF A SODA FOUNTAIN.--Yesterday afternoon while Mr. R. Flanagan, manufacturer of Soda Water, in Sixth street below Race, was charging a fountain with gas, it exploded. The force of the gas carried away a portion of the shed in which the process of introducing the gas is conducted, and Mr. Flanagan was struck in the breast by one of the fragments and seriously injured. Perhaps the nature of this accident convinced Flanagan to return to the hotel business. There is evidence that Flanagan operated a building association, which allowed many working class people to purchase houses using mortgages supported by the savings of other association members. These associations built many of the neighborhoods of Philadelphia. The Flanagan bottle is of a modified English style and of a shape that made it susceptible breakage due to fragility in the neck area as can bee seen in the illustration. The bottle is circulated about 1842-1843 and was made in a Philadelphia area glass works. It has an interesting embossing of "Double Pressure Mineral Water" and backwards letters. The stoneware bottles are highly fired and it is possible that they were used to bottle mineral water as well, but this is speculation at this point. There has been a more traditional Roussel style bottle reported, but no details are known at this time. John Reynolds & Company were primarily beer bottles, with a long history, who branched into the manufactured mineral waters. According to the History of the Friendly Sons of St. Patrick and of the Hibernian Society for the Relief of Emigrants from Ireland, John Reynolds was born in Ballamoney, Ireland in 1802 and came to Philadelphia in 1823. The origin of the firm of John Reynolds & Company was in Reynolds & Warren, who were grocers at 10th & Locust Streets as early as 1825. The partners were John Reynolds and Josiah Warren. During 1829, Reynolds & Warren moved to 5 Pear Street and started a bottling business, which was close to the Abbott Brewery located at 1 Pear Street on the corner of Dock Street. This partnership continued until at least 1833 and by the by 1835 the firm had become William & John Reynolds. During 1841, William withdrew from the firm and it became John Reynolds & Company. Sometime during 1855, Samuel Kirkpatrick left Reynolds & Company and went on to form his own bottling establishment at 265 South Third Street. The same year, the firm of John Reynolds & Company was dissolved and John Reynolds continued the operation on his own account. With the street renumbering in 1857, 14 Pear became 220 Pear Street. Reynolds resided next door to his works at 222 Pear. John Reynolds died on March 1, 1859, according to the above referenced History of the friendly Sons of St. Patrick and he was last listed in the McElroy's Philadelphia Directory for 1859. His son William appears to have taken the helm and is listed in the Boyd's 1859 directory as the owner of the bottling establishment. William expanded next door to 218 Pear Street and remain in business until 1860. During that year, P. J. Jordan & Company purchased the business and operated it until 1862, when Patrick J. Jordan gained full control of the firm. In 1881, it became the P. J. Jordon Bottling Company and in 1884, the Jordan Manufacturing Company. The following year J. P. Jordan & Company was listed as the "estate of" and this appears to be the last year of operation. The Reynolds & Company bottles is of the transitional form that appears about 1844 and are embossed "J. R. & Co. The bottle is known with both an open and improved pontil. All bottles have been found in and around Philadelphia. The bottles were likely manufactured in South Jersey due to their coloration. They date to the period 1844-1845. Schoch & Jones were short lived producers of mineral waters. Cornelius Jones was half of the partnership, but the Schoch side is not certain. There are two likely possibilities; George Schoch, a real estate agent who was may have been looking to expand his business interests, or George Schoch, who eventually set up a bottling establishment at the site of the old Southwark Brewery. My thinking is that the partner was the later bottler, George Schoch, as there was a later connection to the mineral water trade with this individual. In either case the partnership existed in about 1843. The Schoch & Jones bottle is of the English style and not that of the Roussel style that was all of the rage during this period. This bottle could have been manufactured at the reopened Dyottville Glass Works or one of the other Philadelphia and South Jersey glass works of the period. This bottle was later altered when Cornelius Jones had full control of the firm to remove the name "SHOCK" and the "&." This bottle dates to the period of the partnership, which is about 1843. Cornelius Jones was another tavern owner who bottled mineral water. Jones was born about 1813 according to the Philadelphia Census records. He immigrated to the United States from England arriving at Philadelphia on September 3, 1839 aboard the Ship Mongahela with his son William and likely his wife Ellen. He immediately set up a tailoring business at 485 North Second Street. During 1841, he took over the operations of a tavern at 25 Strawberry Street from John Lochary Jr. During 1843, he moved the operation to 26 Franklin Place and during 1845 he took over the Tavern run by of Christopher Harper at the corner of Exchange Place and Carter's Alley and called it the Rainbow Hotel. At some time about 1843, Jones was in a partnership with a Schoch to start a soda water business. This business likely operated out of the basement at the Franklin Place tavern. This partnership was short lived and Jones had control of business about 1844. N. B.--CAUTION.--There is a rumor going about that I have sold out my Mineral Water business, which is a false report, got up to injure my business, by persons late in my employ. CORNELIUS JONES, of the Rainbow Hotel, corner of Exchange Place and Carter's Alley, begs leave to inform his friends and the public that in addition his present establishment, he has fitted up the house, No. 3 CARTER'S ALLEY, above Second, for the accommodation of his friends and the public generally. He has placed in it two SHUFFLE BOARDS for the use of the lovers of that interesting game. The best Malt Liquors and Mineral Waters will be always on hand and the Bar will be stored with Prime Segars. Jones continued to operate the tavern and mineral water business until 1850. It is possible that he over extended himself in opening a second location at 3 Carter's Alley and had to give up both businesses. Jones then returned to the tailoring business and eventually sold hosiery and trimmings on South Second Street, partnering with his son William W. as C. Jones & Son. Jones likely died during 1883. This was the last year that he is listed in the directories and his son is listed as the sole proprietor of the partnership, C. Jones & Son, which continued to operate at 13 South Second until at least 1890. One can only be intrigued the comment on the rumors spread by those "persons late in my employ." Were they Reid & Cecil or maybe Burns & Moon? Being of English origin and residing in England during most the 1830's, Jones was no doubt familiar with the English style of mineral water bottles. When he and Schoch started their business, the familiar egg shape was likely his preference. The Schoch & Jones bottle was altered to make the Jones bottle by replacing the name "SHOCK" with the word "PATENT" and replacing the "&" with a star. These bottles were likely manufactured at the Dyottville Glass Works and date about 1844. There is a rumor of a Roussel style bottle marked Jones, but that has not been substantiated. Henry Croasdill was in Philadelphia, but that is about all that we know at this time. He is listed in the 1850 Census as a twenty-seven year old salesman. The Croasdill name appears almost exclusively in the Philadelphia area. The age of the bottles would put Croasdill at about twenty-two years old when the bottle was produced. It is possible that Croasdill had some experience working with one of the earlier bottlers, such as Roussel or Heiss and then came into some money, either savings or inheritance, and used his funds to purchase the equipment and bottles to start his business. Due to the lack of information, it appears that his business was very short lived. There are no known whole Croasdill bottles and only one fragmentary bottle. The bottle has crude embossing that is atypical of other bottles manufactured in the Philadelphia area. It was likely manufactured in the Philadelphia or South Jersey area, but does not appear to be of Dyottville manufacture. The bottle dates to about 1844. John Moon was a mineral water manufacturer with a spotty history insomuch that he started and stopped manufacturing several times during his career. John Moon was born in Ireland in about 1805 and may have come to Philadelphia in 1834. He married a woman named Eliza and they had their first child John about 1839. This is also the first year that John was listed as a grocer at 15 Fitzwater Street in the southern section of Philadelphia and near the waterfront. From here, he moved the grocery to the Southeast corner of Schuylkill Sixth (S 17th Street) and Lombard during 1842. It is during this time that he appears to have manufactured mineral waters. But how does a grocer enter the mineral water trade? Well it appears John had a relative, R. J. Moon, who had a marble masonry business at the corner of Race and Broad streets and operating under the name of R. J. Moon & Company. Marble chips are a key ingredient in the manufacture of artificial soda and mineral waters. When these chips are combined with sulfuric acid in a generator, carbon gas is generated, which when infused in water carbonates it. John must have used this connection to make a try at competing with the other bottlers of this time. He was not successful and he moved the grocery to the Southeast corner of 13th & Brinton Streets in 1845. The following two years he was at Shippen Lane & Bedford Street. There is no listing in 1848. During this time, the absence of marked bottles seems to indicate that Moon had abandoned the mineral water trade for the first time. Spurious Mineral Water.--An act was passed at the last session of the legislature, to protect the manufacturers of Mineral Water against the injury to their business arising from filling and selling bottles stamped with their names, with an article not of their manufacture. For the first offense, a fine of fifty cents on each bottle filled and sold was imposed, and for every subsequent offense, a fine of five dollars. Within the last few days a man named John Moon, has been taken before Alderman Kenney and fined as follows:--For filling and selling six bottles of Mr. McFarland's. $3; two do. of Mr. Roussel's $1; one do. of Mr. Riddle's 50 cents; five do. of Mr. Twitchell's $2.50. On Thursday, Thomas Connor was taken before the same Alderman, charged with selling twelve full bottles with Mr. McFarland's name thereon, and six full bottles with the name of Mr. Roussel. He was fined fifty cents on each bottle, making a total of $9. John Moon, who was fined a few days since, was taken before Ald. Kenney, yesterday morning, charged with filling three bottles, the property of Messrs. Roussel, McFarland, and Twitchell. The law imposes a fine of $5 in each case for the second offense, and he accordingly had to pay the sum of $15 and costs. At this time, there are no known "Moore & Moon" bottles. With this transfer of ownership, Moore altered the molds to add his name, but left the telltale "B" on the reverse. Moon was listed as a bottler at the old 12th & Brinton streets address in 1856, but perhaps he was working for Moore, who was clearly the owner of the firm. That makes a set of bottles with three names all from the same mold; Burns & Moon (circ: 1849-50), John Moon (circ: 1850-1853), and S. Moore (circ: 1855-57). Moon reentered the mineral water trade a third time in 1856 at Fitzwater & Wyoming Streets. This time he was using a stock mold pony bottle with a plate where his name was cut for the embossing. He remained there for three years until 1859. It appears that he died that year as his wife is listed the following year as a washerwoman at 2340 Vine. The Moon bottle is a recent find and is known with one slightly damaged bottle. The bottle is boldly embossed and has the embossing "Improved Patent" on the reverse, which is reminiscent of the second Heiss bottle. Like the Heiss it has a scar pontil and would date 1843-1844. It too appears to be of South Jersey manufacture. Frederick Seitz, Sr. was born near Manheim, in the Republic of France on June 3, 1801. Early in his life, he apprenticed at a brewery at Carlsruhe, in the Duchy of Baden. Tales of America told by his uncle Sebastian Goundie, who had immigrated to America, enticed young Frederick to emigrate there. Goundie owned the Moravian brewery, established in 1783 in Bethlehem. He conducted the business behind Main Street, on the banks of the Monocacy Creek. According to family tradition, Seitz left his homeland aboard the ship Elizabeth and arrived in Philadelphia in August o f 1819 after long and arduous trip where the captain became deranged. According to port of Philadelphia records, we find that Seitz arrived in Philadelphia on September 9, 1817 on the ship Hope from Amsterdam. It is possible that this could have been a different Frederick Seitz as Sebastian Goundie was aboard the ship Elizabeth that arrived in Philadelphia on August 2, 1819, with his family, but I could not find Frederick Seitz on that ship. This is a small mystery that needs to be unraveled. In any case, the experience traveling to America kept Frederick from ever traveling by sea again. The young Seitz spent a year working at a hotel owned by his uncle John Stapb in Philadelphia in order to learn the English language. He then moved to Easton and established a brewery with his uncle Sebastian and cousin John G. Goundie in 1821. A wheat field Second Street to the Delaware River was purchased from Daniel Bixler for $1,000. The firm of Seitz & Goundie immediately built a brewery there and began brewing beer. The capacity of the brewery at this time was about 500 barrels a year. After much hard work and thrift, Seitz purchased his partner's share of the brewery two years later. John G. Goundie went on to be a brewer in Allentown, has an early soda bottle that bares his name, and spawned a long line of Goundies involved in the bottling trade. Seitz was initially involved in several endeavors, including farming, distilling and operating a milk route. He soon focused on industries that augmented his brewery. First he built a brick malt house on the north side of Ferry Street on land purchased from David Deshler. The building was 50 by 100 feet and had a large cellar and a separate vault that was twenty-five feet under the ground. The vault itself cost $3,000 to build. Initially bottling was done at the brewery and bottles were marked "F. Seitz." One of Seitz's claims was that he was the first brewer to bottle beer in Pennsylvania. Although we know that not to be true because beer was bottled in Philadelphia in the colonial period and a sealed beer bottle from the late 1820s exists, he was the earliest brewer to bottle beer in marked bottles of his own mold starting in about 1844 or 1845. Seitz also built a bottling works on Bushkill Street on ground he purchased from Samuel Wilhelm in 1853. From this point forward, the bottles were marked Seitz & Bro. The brother in this case was likely Henry, Frederick Sr.'s brother who was a clerk in his business and a confidant. From IRS tax records we learn that the firm of Seitz & Brother paid taxes until October of 1865, the following month of November John A. Seitz had control of the bottling business was paying the taxes. Notice is here by given that the subscribers have this day formed a co-partnership in the wholesale brewing business in the borough of Easton, Penna., under the name, style and title of "Seitz Brothers," and will continue the brewing business at the old stand of Frederick Seitz Sr.; who retires from business at this date. Now, the three branches of the business, brewing, malting, and bottling were carried out by his sons. Articles in the Easton Daily Express in February and March of 1871 detail these three distinct business and their proprietors. Henry W. (born 1832), William A. (born 1839) and Edward C. (born 1841) operated the brewery. Charles (born 1836) and Frederick Jr. (born 1837) operated the malt house, and John A. (born 1830) operated the bottling business. Another son, George (born 1829) started as a brewer with his father, but went on to establish a distillery. The brewery in 1871 had a capacity of 80 barrels of ale and 60 barrels of lager a day. By 1873, according to listings in the Easton Directory of that year, John A. and the bottling business joined Seitz Brothers. According to the History of Northampton County, published in 1877, Seitz Brothers consisted of Henry W., William A., and John A. Seitz. In 1898, the business incorporated as the Seitz Brewing Company, which operated until 1928 and was run under several names until closing in 1938. The malting business continued to be operated by Charles, as a separate operation until after 1900. At that time it was known as C. F. Seitz & Company. On retirement Frederick, cultivated his passion for farming and growing of fruits and vegetables. He entered competitions and used green houses and potted trees to increase the quality and production of his crops. He died on June 10, 1880 at his home in Easton. He was 79 years old. The Seitz bottle of vintage for purposes of this article dates about 1844. It is like all of the Seitz bottles were manufactured by Philadelphia area glass works and this earliest one was likely made by the Dyottville works. It is interesting that Seitz and his Lehigh Valley contemporaries continued to use the words "Improved Patent" well after it fell out of vogue elsewhere. Seitz bottles can be dated as follows: Frederick Seitz (1844-1852), Seitz & Brother (1853-October 1865), John A. Seitz (November 1865-approx 1872), Seitz Brothers (approx. 1872-1898), and Seitz Brewing Company (1898-1928). The various Seitz bottles are some of the most collected and interesting in the bottle collecting hobby. John Maicks was a bit of a mystery, but new information confirms his involvement in bottling mineral water starting as early as 1844. There are very few English records available, but he was a prolific advertiser in "Pennsylvania Deutsch," a language based on various German dialects with minor English influences. This language and the old German type face make finding these records nearly impossible using modern search engines. I can extrapolate a story about him, and the firms that succeeded him, based on some of the available records. John and Christian (or Christopher) Maicks came to Reading from Germany. They may have been brothers. Christian was born in about 1811 and John sometime between 1810 and 1815. John was a registered voter in Berks County in 1834, likely in Reading. He also sang between acts for the Garrick Association, a theatrical group in Reading in the late 1830s. Some time prior to 1840, John married Amelia Kissinger and they resided in the South Ward of Reading. John established a confectionary store and was very successful. Additionally, he bottled beer and manufactured mineral waters. Christian, also a confectioner and likely working for his brother, married Lavinia Wunder prior to 1840. Lavinia's sister Margaret married a John Phillipson, a blacksmith. J. Maicks respectfully informs his fine old customers, that he has again started the bottling of mineral water in glass bottles. Maicks continues to advertise the sale of mineral water thru 1848. In that same year, a will for John Maicks was filed in Reading. We know that his wife Amelia was a widow in 1850 and Christian was living next door to his brother-in-law John Phillipson. It is interesting to note that bottles marked Williamstown, N. J. were used by one or more of these firms in Reading and any bottles found in Reading with this embossing could be considered local bottles. Also no bottles are currently know with the marking of William Harbold. John Phillipson continued to bottle beer and manufacture mineral water thru 1865. The following year he was operating a grocery and glassware store in Reading and did not pay any of the special IRS taxes paid by bottlers of beer and mineral waters. In 1869, Phillipson changed occupations again and became machinist and locomotive builder. There are two Phillipson marked bottles (circ: 1862-65). Collectors can be happy that John Miacks' enterprise spawned off ten other firms that produced collectable bottles. The Maicks bottle is a latter bottle of this period and dates 1844-45. The bottle is similar in appearance of the amber Kohl of Lambertville and was likely manufactured at the Dyottville Glass Works and shipped up the Schuylkill Canal to Reading. Unlike the Kohl bottle, this one bears an early improved pontil. This bottle and a slightly later blue soda bottle bear the initial of "J." for John. The two known beer bottles do not and are marked "Maicks Porter." The private mold bottle porter bottle dates to the period of 1846-48, while the plate molded bottle was likely made when his wife was operating the business just prior to or during 1850. William McManus is a bottle which was attributed to Philadelphia, Pennsylvania as a broken bottle was found there in 2009. There were several McManuses listed in the Philadelphia directories, however, these directory listing were not of occupations related to bottling and the the bottle does not follow the Philadelphia style. During the fall of 2011, an intact example was found in an old home in Franklin, New Jersey. Research found that there was a William McManus living there between 1840 and 1850 as he and his family were found listed in the 1840 and 1850 Census records. The 1850 Census does not list an occupation, but the attribution is based on these records and the fact that this bottle does not have the form of a Philadelphia bottle. The McManus bottle is of late manufacture and likely dates to late 1844 or early 1845. It was likely manufactured in the Philadelphia or South Jersey region. The bottle is unusual in that it has the name in arched lettering. Up to this point all lettering was done in straight lines on this style of bottle. One fragment of this bottle was found in Philadelphia and was missing its top. A second intact bottle was found in Franklin, New Jersey. The copartnership heretofore existing between the subscribers, under the firm name of George A. Kohl & Co. was this day dissolved by mutual consent. All persons indebted will please make payment, and those having demands will present them for settlement. N. B. The subscribers would return their acknowledgements for the patronage they have received.- And the public are informed, that the BREWING Business will be continued by the subscriber, who will use his utmost endeavors to give general satisfaction to his customers and the public generally. From 1836 to 1868, George A. Kohl had sole control of the brewery in Lambertville. Kohl was always interested in military affairs and as early as 1840 acquired the title of Captain. In 1843, he led the "Doylestown Guard," a local militia organized in 1835. Capt. Kohl also established the "Lambertville Cadets," which consisted of about 75 to 80 men, who fought in the Civil War. It does not appear that Kohl himself ever served in the military. In the 1850 Census, Kohl is listed as a brewer with property valued at $19,200. In the 1860 Census Kohl was listed as a brewer with real estate and personal property worth $91,700. IRS tax records from 1862 to 1866 indicate that Kohl paid tax on "fermented liquors," soda water, and sarsaparilla. These records indicate that he brewed both porter and ale. There is no mention of lager beer being brewed. We know from some litigation, that Kohl lost a load of $1,500 worth of barley in a shipwreck on route from Albany, New York in 1848. It is interesting to see that he was purchasing his grains from such a distance. George A. Kohl had connections to breweries in other cities on the East Coast of the United States. In addition to his brewery in Lambertville, Kohl also operated a brewery in Easton, Pennsylvania, at first on his own and later in partnership with a Mr. Beans. The exact years of production are not known, but Kohl & Beans were reported to be operating in 1859. The firms appear to be operating during the 1850s. Soda and beer bottles are known from both of these firms. Kohl's son, John A. Kohl, was also a brewer. John was educated in Easton and learned to brew ale at his father's brewery in Lambertville starting about 1840. He moved to Boston, Massachusetts and took a position at the Norfolk Brewery and remained there until 1870. Likely with moneys from his father's estate, he formed a partnership with Andrew Houghton under the firm name of A. J. Houghton & Co. and in 1875 established the Vienna Brewery at the site of the old Jutz brewery. Kohl also had a connection in Norristown, Pennsylvania. On April 3, 1845 the Rev. Studdiford married Abraham R. Cox of Norristown to Miss Caroline E. Kohl, George A. Kohl's daughter. Kohl convinced Cox to purchase the Brewery off of Main Street and briefly partnered with his son-in-law under the firm name of A. R. Cox & Company. Soda water was one of the first products and bottles exist with this embossing. Fairly quickly, Abraham R. Cox had full control of the firm and was a very successful regional brewer who operated until 1890, when the brewery was sold to Adam Scheidt. Kohl died on August 27, 1868 at 66 years of age in Lambertville. According to the January 14, 1869 edition of the Hunterdon Republican newspaper, Kohl's estate sold the brewery and bottling establishment to Tobias Nash of Tinicum Township, Bucks County, Pennsylvania for $11,900 on January 6, 1869. Nash also bought the Kohl residence for $6,000. By 1873, Joseph Akers was the owner of the brewery and bottling establishment. Soda and beer bottles are known from both of these successor firms. The Kohl bottles are known in both green and amber and date to the 1843-44 period. Lambertville is just up the Delaware River from Philadelphia and the Dyottville Glass Works in Kensington where these bottles were likely manufactured. Canals connected Lambertville with Philadelphia and provided a ready route for transport of bottles and Kohl's bottled beers. Charles B. Neale & Company is an obscure firm that operated out of Mount Holly, New Jersey. According to the Bisham Family Genealogy, Charles B. Neale was the son of John Neale and Elizabeth (Bisham) Nealy and was born on July 20, 1822. His lamp black was awarded a "very good" rating by the Franklin Institute at their Nineteenth Exposition of American Manufactures in 1849. The same Bisham Family Genealogy sates the he died on August 20, 1858. I was unable to collaborate any of the information on the Neale family in Mount Holly. The Neale bottle is as rare as the information on the man that produced it. The bottle is not the product of a Philadelphia area manufacturer and was likely produced by a South Jersey glass house. The mold itself does not follow the pattern of Philadelphia area mold makers. This bottle likely dates to the period 1844-1845. Something different happened in Baltimore. Whereas the Roussel style bottle was the norm in the rest of the country, in Baltimore some of the early producers used the Roussel style at first, and then shifted to the English style of torpedo or ten pin shaped bottles. In fact during the period 1845 to 1850, all of the soda bottles used by Baltimore merchants (with the exception of the extremely rare Cole & Co and Cole & Chickering sided sodas) were of the English style. There are at least two possible reasons for this: first, Baltimore was a port city where imported English style bottles were probably in most establishments. These could have been reused by some bottlers who may have had their own bottles made in the same style for constant filling and packaging. Second, this style of bottle was used by Randall & Company and John Lee Chapman, who were fashionable producers. Randall & Company were in the famous Barnum's Hotel and Chapman operated a well known soda water shop and drug store. Perhaps this style of bottle represented a higher class of product. Whatever the reason, collectors can be thankful for these beautifully shaped and variously colored bottles. About 1851 Peter Babb moved his mineral water establishment from Philadelphia to Baltimore, and successfully reintroduced the soda shaped bottle to the Baltimore market. Soon all of the Baltimore firms were phasing out the torpedo and ten pin shaped bottles and using the soda shaped bottles. William Russell and William Coughlan are examples of this shifting of styles. But what to do with all of the old style torpedo and ten pin shaped bottles? Many were filled with soda and mineral waters, packed on ships and sent to the gold fields of California. It seems that more Baltimore bottles of these forms were dug in California than in Baltimore! The firms that utilized the Roussel style bottles in Baltimore style are presented first, and are followed by the Early English styled bottles. OYSTERS!! OYSTERS! !--MILITARY HALL-- THOMAS J. SUTTON informs his friends and the public, that is now prepared to furnish them with the best OYSTERS the market affords, cooked in every variety of style, and in the best manner. Thankful for past favors, he solicits a continuance of patronage. MINERAL WATER.--We neglected to notice the reception on Saturday of a dozen bottles of mineral water, manufactured by Mr. Thomas J. Sutton, at the "white house," opposite the depot, in Pratt street. It is a most delightful beverage, especially for hot weather. After this last 1864 listing, I lost Thomas J. Sutton's trail. The Sutton bottles are very rare and based on the above advertisement date 1843 to 1844. There are two known bottles one in straw yellow and a second in puce. These were no doubt manufactured by the Baltimore Glass Works. 1845 John &, Son, bottling cellar, 11 South st.
1845 John, of firm, h. 17 N. Frederick st.
1845 Robert, of firm, h. 6 Lovely lane. 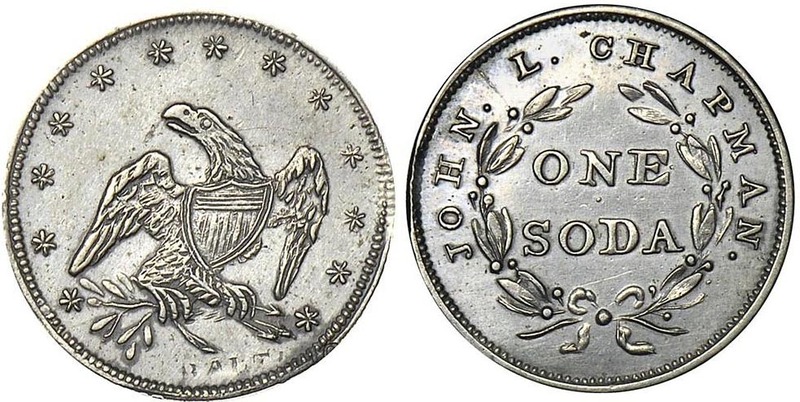 1852 Boyd John & Son, 9 s. Gay. BOTTLERS OF PORTER, ALE AND CIDER, or (sic) home consumption and exportation: dealers in MALT and HOPS, and manufacturers of MINERAL WATERS, have constantly on hand a full supply of these articles, to which they invite the attention of the public. ALSO, CIDER and PURE CIDER VINEGAR, in barrels of the best quality. The dealing in malt and hops eventually led the Boyds to open a malt house at foot of Eutaw Street. The 1853 directory entry for John Boyd as a brewer is likely a reference to his malting operations. Robert Boyd appears to have been disassociated with the firm during 1852 and died in 1853. Robert's estate was processed in 1853. During 1852, John appears to have shifted the business from a bottling works on South Street to a malster and dealer in malt and hops on South Gay Street. Bottling was still done, but was being phased out. The malting business continued to grow and John brought Robert's son and his grandson, John into the business. John Sr. turned the business over to Boyd & Ricketts by 1871 and he died on August 30, 1871 according to the Baltimore City And County History. He was about 84 years old. A John Boyd of Baltimore along with a Jacob Seeger patented an improvement in preserving and using hops in brewing on December 12, 1871. This was likely by Robert's son John, rather than Robert's father. The Boyds used both glass and pottery bottles. They initially adopted the Philadelphia style bottles; except for Eugene Roussel and Frederick Brown in Philadelphia, they are the only firm to use large and small sized bottles. In 1845, they shifted to using the English style bottles and continued to do so until about 1849 or 1850. 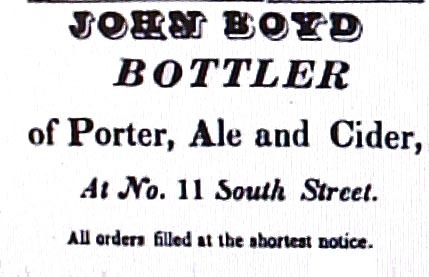 There are no soda bottles known that date after 1850 and there are no marked Boyd beer bottles. All of the Boyd bottles were manufactured by a Baltimore glass works and demonstrate Baltimore colors. The pottery bottles may have been used to bottle soda water or some sort of soft drink, like ginger pop. Randall & Company was a partnership that was made up of Dudley A. Randall and Paris Horton Keach. Both men were born in Rhode Island, but their lives were to follow different paths. Randall was born about 1806 and in 1826 we find that he was living in Providence, Rhode Island as a member of a fire company. Eliza Fenner and Dudley A. Randall were wed in Providence by Rev. Pickering on Oct. 28, 1829. By 1828, Randall is listed as a grocer. Grocers in New England often engaged in the brewing of small beers like mead and root beer. It appears that Randall learned this trade and became proficient enough in brewing, that he relocated to Baltimore between 1832 and 1835 and set up a mead manufactory at 126 Howard Street. He claimed that he had been in this occupation for 11 years in 1844, which may place him in Baltimore in 1833 or perhaps he was brewing in Providence starting in that year. NOTICE.--The undersigned hereby inform the public, that they have again commenced operating at that well known MINERAL WATER ESTABLISHMENT BASEMENT STORY BARNUM'S HOTEL, Monument Square, where is to be had, as heretofore, in connection with MINERAL WATER, that celebrated article, SARSAPARILLA MEAD. They are prepared to furnish Mineral Water SYRUPS, in all their varieties. They are also prepared to serve a FEW MORE customers with MINERAL WATER by the FOUNT. They hope to merit and receive that encouragement heretofore bestowed upon this establishment. D. A. RANDALL & CO.
DISSOLUTION OF PARTNERSHIP. --The partnership heretofore existing between the undersigned, under the firm of RANDALL & CO., was by mutual consent dissolved on the 31st of October, 1843. PARIS H. KEACH having disposed of his entire interest in the late concern to his late partner, DUDLEY A. RANDALL, to whom persons having claims against said firm will present them for settlement, and those indebted will make payment to either of the undersigned. D. A. RANDALL will continue business under the style of RANDALL & CO.
At their Mineral Water Establishment, basement of Barnum's Hotel, or at their Manufactory, McCausland's Old Brewery, Holliday street, near Pleasant. so much admired, particularly by the ladies; CONGRESS and other SPRING WATERS, direct for the proprietors. Cash all times paid for Congress Water Bottles. I am also prepared to furnish water by the Fount, as heretofore. FOR SALE.--Fourteen SODA FOUNTS, in good order, and used by me last season, varying in size from ten to twenty two gallons, are offered very low, to give place to new ones of uniform size. I will hereafter do business in my individual name, in place of Randall & Co., as heretofore. The name Randall & Company was no longer used after the end of the 1846 season. 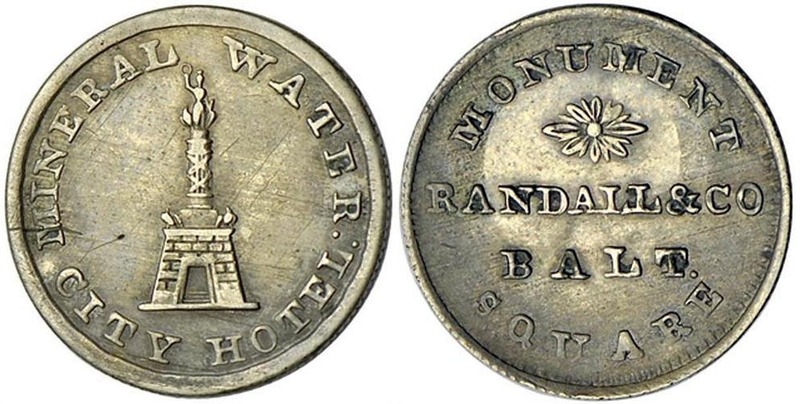 Randall continued to operate the mineral water rooms under Barnum's Hotel until 1871, which was the last year he was listed in the Baltimore directories as a mineral water manufacturer. 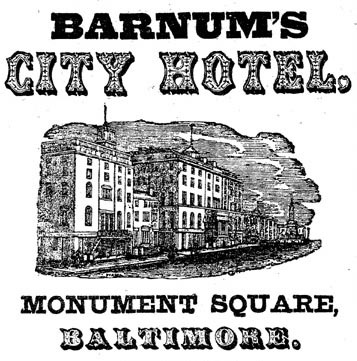 This is supported by the following ad, "FOR RENT THREE ROOMS In Basement of Barnum's Hotel corner of Calvert and Fayette formerly occupied by D A Randall," that appeared in the February 15, 1872 Baltimore Sun. Randall appears to have retired briefly, but started to sell coal as early as 1877 and was listed as a coal merchant in the 1880 Baltimore Census. 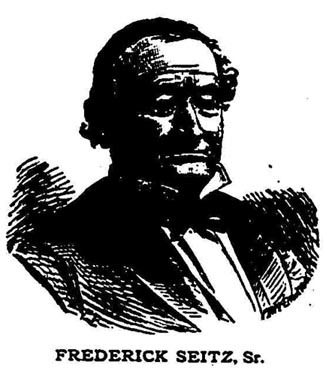 He died on February 6, 1881 as reported in the Baltimore Sun. The following year Celia is listed as his widow in the Baltimore Directory. The Randall & Company bottles may date to before or after Keach's exit of the firm in late 1843. I believe that these bottles date to 1843 and were manufactured by a Baltimore glass works. I suspect that Keach was interested in developing the bottling business, but Randall wanted to invest in the Hotel's mineral water fountain. As documented above, Randall disposed of the mead and root beer business and appears to have overhauled the mineral water fountain soon after the split happened. When Keach left, he might have taken the Randall & Company bottles with him to develop the bottling business. In 1845, when Keach greatly extended his bottling business, he likely had molds made with his name cut into them. Polk & Company, who also have bottles marked "Barnum Building," were not successors to Randall. They operated at the same time, but in a different location of the hotel on the opposite corner. They were druggists in the early 1850s. INFORMS his friends and the public, that he has purchased out the Stock of Dr. G. Maris, corner of South and Market streets, where he intends to carry on his business of APOTHECARY, and hopes to merit and receive a share of public patronage. Great care will be observed in putting up prescriptions. On January 1st of 1840, as advertised in the Baltimore Sun, due to an "extravagant increase in rent" Chapman closed the South and Market Street location and moved to 2 South Street. By 1842, he had opened a new branch store at 25 Sharp Street, but that store was closed by 1845. MINERAL WATERS.--The public are informed that I have purchased the Soda Apparatus, and shall continue to manufacture SODA WATER exactly as prepared for the last eight years by my brother, John L. Chapman, who has relinquished the business. I desire to inform those that have given him the preference, that I do not supply any one at present. CAUTION.--I shall in all cases where I supply them, insist upon the name of "Chapman" being placed on the top of the Mineral Water Sign, to guard against imposition. FOR SALE--The subscriber intending to change his business, offers his APOTHECARY STORE, No. 2 SOUTH STREET, for sale. It is a central situation and long established, doing a good retail business. John Lee and brother Jonathan formed a partnership and opened a glass factory called the Maryland Glass Works. John Lee operated the works and Jonathan sold the products. McKearin and Wilson state that the works were likely built in 1847 and were in operation in 1849, which is supported by directory listings. By 1860, the works were being operated by Jonathan and were abandoned by 1862. Mr. Chapman took an active part in local politics...In 1860 he was elected a member of the first branch city council from the fourth ward, he living then on the corner of Stiles and Exeter streets, having served in the same ward in the same capacity for several years previously, and was chosen president of the branch. In the fall of 1861, when Mayor Brown was removed from office through arrest by the military authorities, Mr. Chapman became acting mayor of the city and served out Mr. Brown's term. In 1862 he was elected mayor... and in 1864... in 1866 he was elected again, but did not serve the term out, the democratic party having come into power...and by adopted of a new constitution a new election was ordered.......While Mr. Chapman was mayor the introduction of a new City Hall was begun...water rights secured for construction of the Gunpowder water supply...he was an ex-officio member of the police board. Mr. Chapman took an active interest in the Western Maryland railroad, and was elected president...in November 1866, which position he held for two years. He gave much attention to the building of the road as far as Hagerstown......While president he purchased a tract of land at Blue Ridge, which he owned at the time of his death. In 1869 President Grant appointed him naval officer at the port of Baltimore, which position he held for four years.....until appointed...to position of superintendent of public stores...In 1877...the office held by Mr. Chapman was abolished....Mr. Chapman was afterwards appointed one of the district inspectors, and subsequently a storekeeper at warehouse No. 60 Buchanan's wharf, which position he held at the time of his death. He was regarded a good and faithful officer, and was a man of decided opinions and strong character. He was married twice.....His second wife was the daughter of Mr. Wm. Thompson, a well-known citizen of Washington.....By his first wife Mr. Chapman had six children, three of whom are dead. The three that survived are daughters.....By his last wife Mr. Chapman had one son, who is about seven years old, and is a namesake of his father. The Chapman soda is a bit of an anomaly. The lip is unique amongst early soda bottles. I believe this bottle dates to the period 1840-1844 and may be Baltimore's oldest soda water bottle. It comes in both a copper puce and aqua coloration. Since Jonathan Chapman does not mention bottling equipment for sale in 1847 nor in the 1845 ads, it would appear the bottling aspect of the business was abandoned earlier. The puce colored bottle must have been made in Baltimore, but the aqua version could have been blown elsewhere. Rushton & Aspinwall's early history was document in the previous chapter. They continued to bottle soda waters in the early years of the 1840s. A May, 1841 advertisement now mentions that carbonated lemonade was now being bottled in addition to soda and Seidlitz waters. Perhaps the influence of Roussel's lemonade was being felt in New York City. Note that the ad also states that the bottles contain one glass each indicating the size of the bottles. The firm continued to remain at remained at the 86 William, 110 Broadway, and 10 Astor House locations until January of 1843, when the partnership dissolved as noted by the advertisement shown. William L. Ruston went on to form the firm of Rushton & Company, which consisted of himself and William Hegeman. They kept the drug stores at 110 Broadway & 10 Astor House. James S. Aspinwall went it alone and kept the drug store at 86 William Street. It is interesting to note that both firms continued to sell bottled mineral waters. There appears to be one lone bottle used during this period of 1840 to 1842. Since the soda water business was a May to September endeavor and the firm was about to dissolve, it seems unlikely that bottles were either produced or used in 1843. Rushton & Aspinwall continued to favor the English style bottles and the manufacturer that they used produced a better quality of glass than was used previously. Although both surviving firms continued to manufacture and bottle soda water, there are no recorded bottles with their singular names embossed. There should be Rushton & Company and James S. Aspinwall torpedo styled bottles. It is likely that the invasion of the Philadelphians in the spring of 1843 drained their bottling business and made them focus on the traditional drugstore business. George D. Coggeshall was one of the most influential pharmacists in New York City during the Ninetieth Century. He was born in 1807 and died on November 5, 1891. He was an 1828 graduate of Philadelphia College of Pharmacy and moved to New York City and where he established his own drug store. He was a founder of New York Pharmacy College, where he was president from 1851 to 1854. He was also elected the first recording secretary in 1851. In 1840, Coggeshall started to advertise that he was an agent for Swan's Atmospheric Soda Fountain, which was patented on November 3, 1838. During 1840 and 1841, he also advertised that he was a "Chemist, Druggist, and Manufacturer of Aerated Waters." I was not able to find references to his production of "aerated waters" prior to or after these years. The Coggeshall bottle would date to the 1840-41 period of Coggeshall's advertisements. It is an olive green color and is a more refined nature that the bottles of the previous decade. Coggeshall continued the tradition of using English styled bottles that were prevalent in New York prior to the invasion of the Philadelphian's and their Roussel style bottles. The above are bottles of the old guard of New York City soda and mineral water bottlers. The new guard had arrived form Philadelphia and their new style of product and bottles would be much more successful and present a dramatic change. Note the uniformity of the New York City bottles to follow as compared to the ones listed above. 1855 New York Tweddle Thomas B. maltster, 2 Broome, h. 40 Lexington av. 1857 New York Tweddle Thomas B. maltster, 2 Broome & 295 E. 11th, h. 40 Lexington av. 1858 New York Tweddle Thomas B. maltster, Broome c Tompkins, h. 118 Lex. av. 1859 New York Tweddle Thomas B. maltster, 10 Broome, h. 118 Lex. av. 1860 New York Tweddle Thos. B. maltster, 6 Broome, h 118 Lex. av. John Jr. operated out of 38 Cortlandt Street in 1844 and remained there until 1848, which nicely dates the bottles marked with that address. He also entered the malting business that year on Broom Street. The property and dwelling at 41 Barclay Street became available for rent according to the New York Tribune in December of 1848. The property was described as a "valuable three-story basement dwelling-house" and the location "one of the best in the lower part of the city." Tweddle subsequently moved to 41 Barclay in 1849 and remained there until 1854. The 1856 Directory listing is likely a misprint copied from the 1854 Directory as in 1855 Hopkins and Brothers were listed at 41 Barclay selling imported paints and oils, according to the New York Times in that year, and John Jr. was listed as living at 41 Walker Street. And on February 9, 1856, the contents of 41 Barclay Street were being auctioned of because the building was to be demolished according to the New York Times. New York City Directories were published in the month of June, and not January like in most cities. Thomas B. closed up shop in West Chester in 1850, sold his equipment to his brother John Jr. in New York, and eventually moved to New York to join his brother. The two brothers and their brother-in-law, A. C. Palling, formed the malting company at the established location at 6-10 Broome Street under the firma name of J. Tweddle Jr. & Company. John Jr's death in Bergen, New Jersey, was recorded in an 1868 Albany newspaper on February 13, 1868. The early Tweddle bottles were likely manufactured by Philadelphia area glass works and likely at the reopened Dyottville Glass Works. The bottle with out the embossing of "PATENT" on the reverse and no city is the earliest and dates to 1843. The two bottles with the word "PATENT" on the reverse date to 1844. John Jr. has several later bottles that bear the address of 39 Cortlandt Street and 41 Barclay Street date 1845 to 1848 and 1849 to 1854 respectively. One of the early bottles has Tweddle misspelled Twedle and another later bottle has the "J" in "JR" reversed. Newton was clearly bottling soda water in New York due to his winning a diploma for "the best bottled Soda water with syrups" in October of 1843 from the American Institute in New York. It is interesting that Newton was located at 7 Elm Street for only one year. Part of the issue may have been the neighborhood. In the September 4, 1847 edition of the New York Tribune, we find Newton was a complainant against "persons for keeping houses of ill-fame." These included a number of women from numbers 11, 12, 25, 27, 27 1/2, 29, and 30 Elm Street. In 1849 Newton appears to have left the soda water business. In 1850, we find that Newton was living in Brooklyn and it appears he briefly reentered the soda water business but soon returned to his older profession as a plumber and gasfitter. He likely resided in Brooklyn until 1854, when he resurfaces as a gasfitter living at 38 Eldridge in New York City. From an 1877 article in the New York Sun newspaper we find that Newton was a gas engineer for the Bowery Theater for 35 years. Newton appears to have died in late 1878 or early 1879, as this is the last year that he is listed as an engineer living at 256 Madison Avenue in the New York Directory and he could not found in the 1880 Census. He would have been about 76 years old. There is only one known Newton & Company bottle that dates to the early period being covered by this article. This bottle dates to 1844. There are four later bottles from this firm that date from the period1845-1848. The best of these is a rare scalloped shouldered blue soda that dates to 1848.
authorized to settle up the affairs of the said firm. By July 2, 1846, the business reorganized with Alexander Dearborn and William Boggs under the name of A. Dearborn & Co. as advertised in the same New York Evening Post. By September 18, 1846, Rapp republished his book on penmanship and was teaching it to young gentlemen between the ages of 20 and 40 to serve as instructors at 498 Houston Street. We loose track of Rapp until 1850 when he is residing in a Brooklyn hotel according to the Census records for that year. By January of 1852, he has made his way back to Philadelphia, reaches back into his past experience, and is issued patent number 8,641 for a gold pen. This patent was reissued on July 22, 1856. He immediately starts extensively advertising his pens and establishes a shop in Philadelphia for their sale. His last directory listing is in 1856 and he may have died during that year at nearly 70 years of age. 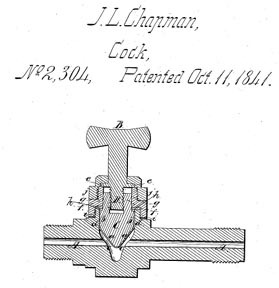 This may also be why his patent was reassigned in July of 1856. Adam W. Rapp's brother Henry B. Rapp was an agent for the Dyottville Glass Works in 1844 and 1845. Rapp's later bottles are marked Dyottville and there is little doubt that his early bottles were manufactured by this Philadelphia glass works. The first bottle illustrated will date to 1843 and the second 1844 and are reflective of bottles made in those respective years. Bostwick must have tired his hand at manufacturing soda water based on the success that he saw amongst the Philadelphians. His working knowledge of metalwork may have served him well in producing soda waters. His trail was not successful, and he appears to have returned to the trade of silversmith. An 1844 advertisement, lists Bostwick at 128 William Street, which at the time was the business of William Thompson. In 1845 Bostwick purchased Thompson's business, which had its roots back to 1801. An 1846 advertisement lists the wares he had for sale in an appeal to New York City families. In the 1850 New York City Census Bostwick is listed as a thirty-six year old silversmith born in Vermont. Bostwick is reported to have died in 1852 and left several young children with his wife. Pieces of his silverware are in the collection of Brooklyn Museum and are frequently offered for sale at auctions. Bostwick's silverware is much more common than his bottles. The Bostwick bottle is typical to those used in 1843. It bares a scar pontil and was no doubt the product of a Philadelphia area glass manufacturer. After 1845, no further entries were found for Jenkins & Company. The bottles themselves date to 1844 and have the slightly taller stance than the bottles from the previous year. It also bears the embossing "Improved Patent" on the reverse side, which is a hallmark of 1844 and 1845 bottles. There is no known patent or improved patent associated with these bottles. It is most likely that these bottles were manufactured by a Philadelphia area glass manufacturer. MINERAL WATER.-The subscribers having secured the services of Mr. JOHN REED, of Philadelphia, a celebrated Manufacturer, and for a number of years foreman of Mr. E. Roussel's well known Mineral water Establishment, are now prepared to offer the public an article flavored with all different syrups, and superior to anything that has been introduced, and have no hesitation in saying that it is fully equal to Roussel's famous article, which have been pronounced by competent judges to excel all others. For sale by the dozen or gross, and sent to all parts of the city. corner of Portland and Hanover streets. FRENCH SODA WATER, The undersigned is sole agent for Carter & Wilson's Mineral Water, and will supply Hotel Keepers and Families, at the Manufacturer's price. This article is beautifully flavored and is far more sparkling than that drawn from the fountain; and, being kept in glass, all metallic taste is obviated. For sale by the dozen or single bottle, and in larger quanties (sic). A full supply will be kept well iced during the summer,--those desiring a fine glass of Soda, will please call at No. 256 Essex street. According to the Proceedings of the American Pharmaceutical Association at the Fortieth Annual Meeting 1892 Solomon Carter died at Savannah, Georgia on April 11, 1892 having moved there due to poor health. I was not able to find any biographical information on John Wilson, but it appears that his son, John Wilson, Jr., was also a druggist who practiced in Boston as part of the firm of Fairbanks, Wilson & Company. MINERAL WATERS, MANUFACTURED BY Carter, Wilson & Co. corner of Portland and Hanover streets, Boston. They are prepared to furnish Hotels, Refreshment Saloons, Families and Parties with superior Mineral Water in glass bottles, with different flavors, at short notice. We wish the orders be sent in as early as convenient. The bottles are of a different form that those of Philadelphia and may not have been manufactured in the Philadelphia region. I do not have any evidence that McIntire was in New Orleans, but he may have moved there briefly, shipped his wares there, or sold his bottles to a soda water manufacturer there. It has been reported that some of his bottles have been found in New Orleans, but it is very interesting that the squared collar on his newer soda bottles, which has a top that is unique on soda shaped bottles, is identical to the top on the 1845 Darling & Ireland torpedo and C. A. Browne soda bottle, which are also from Boston and of the same period. The early bottle dates to 1844 and was likely manufactured by a Philadelphia area glass works. James W. Garrison was reported to be a druggist in Louisville, who was reported to be selling soda and mineral waters as early as 1838. I have not been able to find reference to Garrison as a druggist, but did find reference to him bottling soda and mineral waters. Garrison was born in Virginia in about 1805 according to Census records and he married Mary Jane Foster on January 27, 1844 in Louisville. Garrison is listed in the 1850 Louisville Census as a "Soda W. Manufacturer," with holdings of about $6,000. He is again listed as a "Soda Manufacturer" in that 1860 Census with holdings of $25,000. Directory listings put the business at 13 Bullitt St. or Bullitt alley, which was between Main and Market Streets and Fourth and Fifth. Garrison not only sold soda and mineral waters, but also "sirup (sic)." Garrison died some time between 1861 and 1864. The business was carried on by his wife Mary Jane Garrison and David Enochs under the firm name of M. J. Garrison & Company until 1866. Enoch may have run the business for one year after that alone as Mrs. Garrison appears to have left Louisville in 1866. In 1871 H. G. Prenger & Company were operating out of 13 Bullitt Street and sided soda bottles exist from this firm. The Garrison bottles mimic the Philadelphia style and should date 1844-1845, making them the oldest in Kentucky. They were likely manufactured by one of the many glass manufactories operating in Pittsburgh. The glass color is somewhat different than that of Philadelphia and the expenses of shipping bottles from the Philadelphia are would have been prohibitive. Edward Jenner Coxe, M.D., University of Pa., 1823, son of John Redman Coxe, M.D., and Sarah, daughter of Colonel John Coxe, of Bloomsbury, Trenton, New Jersey, was born December 8, 1801, at Philadelphia. He married Mary Louisa, daughter of Louis Clapier, of Marseilles, France. He died at New Orleans, September 21, 1862. When twenty-three days old, he was vaccinated from the cow; so much faith had his father in the virus that he placed him in the arms of a man dying of smallpox. The disease did not prove contagious. The child was called Edward Jenner, after the great benefactor of mankind. 419 Chesnut Street, the early name for Chestnut Street and the office of Coxe, was about one block away from the Northeast corner of Broad and Chestnut, the location of Macpherson's drug store. The two young men must have formed a close friendship and decided to relocate to New Orleans and open a drugstore there. The 1840 New Orleans Census list both men living next to each other with no other members in their households. In 1842 and 1846 New Orleans Directories, they are listed as druggists under the name of Coxe & Macpherson at 29 Camp St. According to the book American Pot Lids, the firm dissolved in 1847. Macpherson continued to operate the drugstore at 29 Camp Street, while Coxe practiced at a different location. Coxe became a well published authority on cholera and developed medications to treat the disease. He also presented information that led to the development of the cottonseed oil industry. Coxe and Macpherson likely retained close associations with family, friends, businesses and the professional organizations that existed in Philadelphia. Many of Coxe's publications, while he was in New Orleans, were published in Philadelphia. Philadelphia was also the leading supplier of drugs and chemicals. So it seems likely that they would have known about the soda water craze that was taking place in Philadelphia in the early 1840s and took a stab at the bottling business. Their soda water bottle bears the form that was used about 1844 and was likely made at the Dyottville Glass Works in Philadelphia due to the similarity in color, form, and manufacturing technique to the Philadelphia bottles. 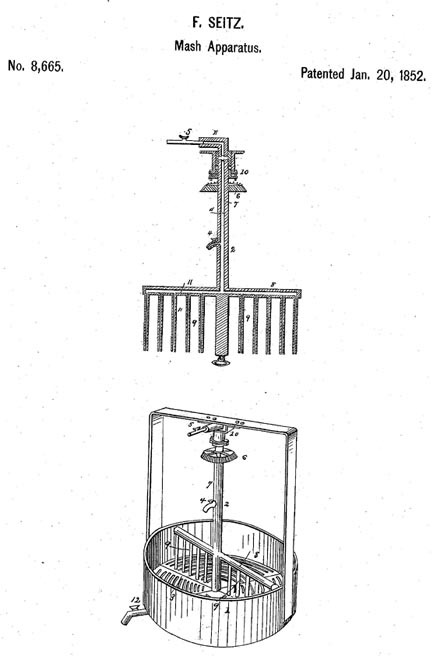 THE Subscriber respectfully informs tha Public that he has imported direct from Paris complete apparatus for making artifical Mineral Waters, as Soda, Seltzer, and others, which in all respects resemble those obtained from the springs, they have been analyzed by distinguished chemists, and found to contain precisely the same component parts as the natural water of the springs. He also prepares Gas Lemonade, Raspberry and Current Waters, and many other delightful effervescent drinks, such as are well calculated to please the palate during the hot days of summer, while they invigorate and refresh the body; all of which he will furnish to families or individuals, by the single bottle or by the dozen, on the most reasonable terms, at their residences, or at his Restaurant on 19th street west, near Pennsylvania avenue, or at his Garden, between 17th and 18th streets west, about four squares north of the President's House, where the apparatus may be examined by such scientific gentlemen as desire to do so. A. FAVIER. N. B. All kinds of Syrups may be obtained as above. A. FAVIER would respectfully inform the public that he is now prepared to furnish his Mineral Water in bottles to families, at their residence, in a great variety of flavors, such as Raspberry, Lemon, Strawberry, &c.; together with plain seltzer, soda, Saratoga, and other mineral waters. A. F. would respectfully invite your attention to the subjoined statement in relation to these waters, which you will perceive is signed by Dr. Thomas P. Jones, formerly Professor in the Franklin Institute at Philadelphia, and more recently Professor of Chemistry in the Medical Department of the Columbian College in the District, and the late Dr. Frederick Hall, Professor of Chemistry in the last named institution, together with many of the most eminent physicians in the District. The proprietor would state that the water made by machines like his is very extensively in use in Paris, and is daily becoming more so on account of its great celebrity and invigorating, and refreshing qualities as a summer drink. Orders directed to A. FAVIER, 19th street west, near Penn. avenue, will be promptly attended to. A. F. has also on hand for sale sirups in great variety of flavors. The bottles can be sent to any part of the District, and so packed as to be sent to any of the neighboring cities. Although Favier had listed bottles waters an 1840 advertisement and an 1843 directory listing which is a copy of the same advertisement, there was no mention of bottled waters until the above 1844 advertisement. The known bottle dates to this exact time period. It is likely that the 1840 advertisement used bottles that were not conducive to bottling pressurized mineral and soda waters and were quickly abandoned. Favier continued to rent rooms in his home and serve dinners for paying customers and private parties. In December of 1845, he converted his bar into a "Confectionary and Comestible Establishment" as advertised in the Daily National Intelligencer on December 20, 1845. Perhaps he was feeling the pressures of the Temperance movement. Over the next several years, Favier continued to improve and expand his businesses. In 1846, he added a Swiss Cottage to the Park to be rented for parties and perfumery and fancy goods to his confectionary store. Up until 1847, Favier appears to had a monopoly on the bottled soda water business, but that was about to change. In the spring of that year Julius Rother, a vinegar manufacturer in nearby Georgetown, turned his attention to the mineral water trade. The two faced off in adjacent ads during 1847 with each touting the medical properties of their waters and sporting a list of eminent scientist and physicians indorsing their products. Favier touted his French equipment and Rother his American made fountain. 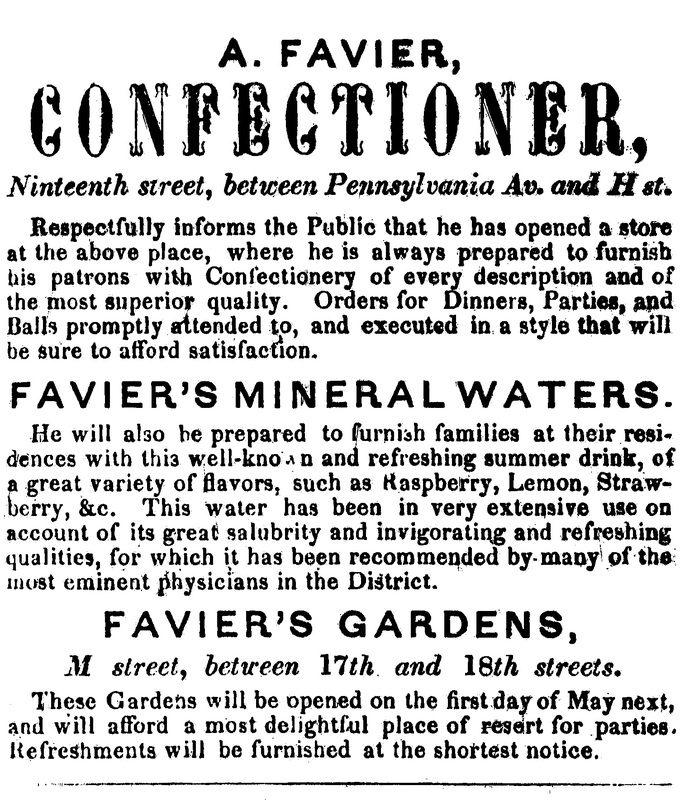 Favier ran an advertisement in the Georgetown Advocate on August 12, 1847 where he had analysis done on mineral water in white bottles, his, and green bottles manufactured by another manufacturer (Rother). That in the white bottles was pure and that in the green bottles had the taint of sulfuric acid. Collectors should be on the lookout for clear or lead glass Favier bottles, which may or may not be embossed. In 1848 due to the success of his other businesses, or perhaps competition from Rother, Favier was seeking a partner or a leasee to operate the Spring Garden park and the Mineral Water operations. Unfortunately, a fire destroyed the mineral water operations during the summer of 1848. Favier quickly reopened the works and added a new ice cream and mineral water saloon to his mix of businesses. A CARD.-A. FAVIER gives notice to his customers that an injunction has been granted by the Circuit Court of this District upon his bill of complaint against Julius Rother, commanding and enjoining the said Rother, his agents and servants, from collecting and using the mineral water bottles bearing the name of A. Favier, and belonging to him. He has been informed that this injunction has been repeatedly violated, and is determined, if the fact being so, to bring the parties to proper punishment for a contempt of Court at its next meeting. Meantime he thinks it due to his customers, as well as to himself, to put them on their guard against a spurious article not manufactured by him. A. FAVIER respectfully sends his sincere thanks to the Medical Facility for the recommendation of his Analyzed Mineral Waters to their patients and the public in general. His mineral water has been analyzed twice by the most distinguished chemists; first by our late Dr. T. P. Jones in 1837, and the other by our Dr. Page in 1847. A. F., to continue to merit the same approbation, has sent to Europe for one silver-plated machine, which is daily expected. In order to prevent any misunderstanding, he has changed the shape of his bottles-the octagon bottles are engraved "A. Favier, Spring Darden, Analyzed Mineral Water," nad the round ones "A. Favier, Mineral Water, recommended by the Medical Faculty." Wanted, immediately, two good colored boys, to work in the establishment, from twelve to fourteen years of age. The description of the bottles, although backwards in description, should accurately date the later Favier bottles. The following year, Favier, likely due failing health, was seeking a partner or to lease either individually or jointly the mineral water business or the park. On October 23, 1854, Agricol Favier died after a lingering illness of four months and his wife continued the businesses and tried to lease or rent them apparently without success. By the summer of 1855, Spring Garden Park, on M Street between 17th and 18th, was under the control of Christian Lightsbecker. The last advertisement for the lease of the mineral water manufactory was in December of 1855, by this time, several competing makers were present both in Washington City, Georgetown, and Alexandria, and the value of the business was diminished and was likely sold at auction soon after. This bottle is certainly a product of the Baltimore Glass Works and is from about 1844 and bears an early improved pontil. There is one known bottle and it is heavily repaired. Davenport & Company is from an unknown firm that may have been from the Middle Atlantic States. There are at least two bottles known; one was picked in south central Pennsylvania and the other resides in a collection of Southern soda water bottles. There are the initials of D. G. & K. on the reverse of the bottle. Whether this stands for D. G. & K. Davenport & Company or Davenport, G? & K? is not known. There was a David G. Davenport who was born in Maryland and was a farmer in the Midwest in 1850 and in the same year there was a Chicago coppersmith named D. Davenport who was born in Vermont. It is possible that either of these individuals could have been members of this firm when they were on the East Coast five or six years prior. There were no male Davenports found in the 1840 or 1850 Census records whose name stated with a "K."
The bottle also has the words "Mineral & Soda Waters" embossed on the face of the bottle. Only the Carter & Wilson bottles from Boston and the Bentley bottles from Philadelphia use both these products embossed on the face of the bottle. Both these firms used the term "Soda & Mineral Waters" whereas the Davenport bottles have the terms reversed as "Mineral & Soda Waters." The Davenport bottle also has the word "Patent" embossed under the initials on the reverse. All other bottles of this style have "Patent" embossed on the reverse shoulder of the bottle. More research and a little luck is needed to identify the firm that used this bottle. The Davenport bottle has the attributes of a bottle that should date to the period 1844 and may have been manufactured by a glass works in the Philadelphia or South Jersey region. C. A. S. is embossed on a bottle found in the Ohio area. The only name that I have in my database that matches these initials and was operating during the 1840s was C. A. Sammis of Hempstead, Long Island in New York State. It is doubtful that this bottle is from Sammis as there were already a number of manufacturers in the New York area and I do not believe Sammis was operating in the early 1840s when this bottle was produced. C. A. is a name pattern that I have seen often in old records that would have often stood for "Charles A." There are no Eastern bottles that bear the embossing style of this bottle with just initials and embossed vertically across the face of the bottle. This coupled with the fact that this bottles was found in Ohio makes it seem more likely, to me, that this bottle is from a major city along the Ohio River. Possible candidates are Pittsburgh, Wheeling, Louisville, or Cincinnati. Sutton is a name that occurs on early soda water bottles in Cincinnati and may be associated with this bottle. However, the Sutton that has the earliest bottles was named Isaac. This bottle was likely manufactured by a Pittsburgh area glass manufacturer and dates to the period of 1844. It could be a year earlier as this bottle has the form of an 1843 bottle, but it is likely that the Midwestern mold makers were stylistically a year or two behind their Eastern mold maker counterparts. It is also interesting to note that the mold maker forgot to cut the cross bar on the "A" in the mold. This makes it an error bottle. L. D. is embossed on a bottle found in the Philadelphia area. These initials do not align with any period mineral manufactures. There was a Philadelphia firm named Long & Dubois that bottled beer and mineral waters starting about 1856, but that firm is too late to have used this bottle and there is no ampersand embossed on it. The bottle is of an unusual form and bears an improved pontil. Two of these bottles were found in Philadelphia in a single privy. It is possible that they are from some other location and were deposited by a wayward traveler visiting from some unknown destination. These amber bottles were not made by one of the mainstream glass houses in Philadelphia as the soda form was well defined by the time these bottles were manufactured and it is unlikely they would have made this odd-ball form. They may have been made by one of the lesser known Philadelphia works or one from Southern New Jersey in about 1844. Interestingly, this bottle has a similar form, color, and improved pontil, to the C. B. Neale & Company bottle from Mount Holly, New Jersey and it is likely that the molds were made by the same mold maker and that they were made at the same glass house at about the same time. One intact specimen was found and one damaged that has since been repaired. Unnamed bottles are those that are unembossed or only have a product name embossed and were produced by glass houses for soda and mineral water manufacturers who could not afford to have molds made with their names embossed on them. These bottles cover the full period of 1840 to 1844.